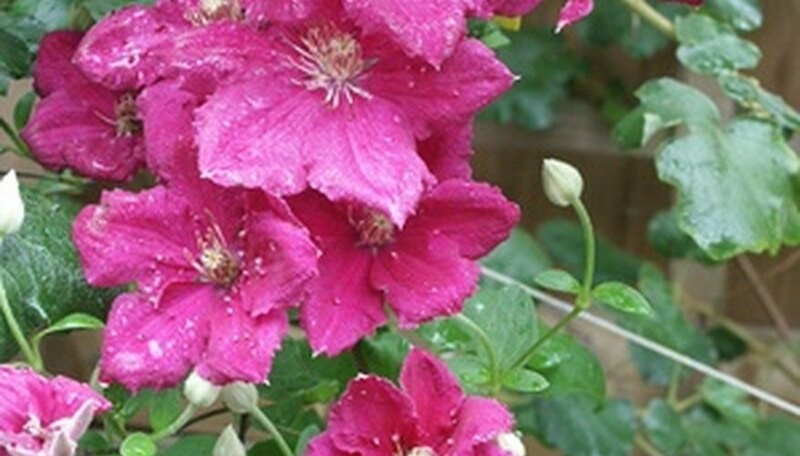 Clematis is a vining plant member of the buttercup family. Propagation of the climbing vine is accomplished in three ways: root division, stem cuttings and planting seed. Seed propagation takes the longest amount of time. You can start new plants from either collected seeds from an existing vine or from nursery-purchased seeds. Depending on the variety, the clematis will live for 25 years or more and may produce up to 100 blooms over the growing season. Seeds can be started indoors during the fall. Stratify the collected or purchased clematis seeds in the refrigerator for a period between 60 to 90 days. The seeds must be held at a temperature of 40 degrees F. Stratification is a method of cold treating seeds so those seeds will germinate. Mix equal parts of peat moss and sand into a 6-inch pot. Fill the pot to within an inch of the top rim. Add 1 qt. of water to the soil mixture. You may have to add the water a little at a time. Allow all excess moisture to drain from the bottom holes. Place five or six seeds, evenly spaced, on the potting soil. Cover the seeds with a ½ inch of soil medium. Set the pot in a sunny location, indoors or outside. Keep the soil moist. Germination will take place in approximately three and a half months. Keep the plants from freezing by bringing indoors during the winter. Allow the plants to grow until the following spring. Select a permanent location that will receive at least six hours of full sunlight. Dig a transplant hole 24 inches deep and 36 inches in diameter. Incorporate approximately one-third volume of compost or rotted manure into the hole. Divide the clematis seedlings from the 6-inch pot. You can place two seedlings per transplant hole if you desire. Keep the soil line from the pot equal with the new location. Press the soil around the clematis seedling’s roots. Add water to remove air from around the roots and improve the soil contact. Erect a wood trellis behind the clematis. Train the clematis vine to the trellis. Wood trellises may be purchased at most home and garden stores. Place even store purchased seeds under stratification unless the label package specifically identifies that the seeds contained in the package have been fully stratified.